Harry Dresden – Wizard. Lost items found. Paranormal investigations. Consulting. Advice. Reasonable rates. No love potions, endless purses or other entertainment. Harry Dresden is the best at what he does. Well, technically, he’s the only at what he does. So when the Chicago PD has a case that transcends mortal creativity or capability, they come to him for answers. For the “everyday” world is actually full of strange and magical things – and most of them don’t play well with humans. That’s where Harry comes in. Takes a wizard to catch a…well, whatever. There’s just one problem. Business, to put it mildly, stinks. So, when the police bring him in to consult on a grisly double murder committed with black magic, Harry’s seeing dollar signs. But where there’s black magic, there’s a black mage behind it. And now that mage knows Harry’s name. And that’s when things start to get…interesting. I seem to have a kind of patchy relationship with urban fantasy. I want to like it and there’s really no reason why I shouldn’t and I keep enthusiastically starting series and never getting past the first book. It’s only now that I’ve read Storm Front that I’ve even started to pinpoint what those first instalments are often missing; a mixture of character development and background and a decent plot, plumping instead for rather than too much of one or the other. The thing that set Storm Front apart was that it didn’t try to do too much. Harry is a wizard and there’s a good amount of detail about the type of magic readers can expect to see in the series but there aren’t a whole host of other paranormal beings interfering all over the place. Vampires are mentioned and one is introduced and the occasional demon is summoned forth to wreak some havoc but the extras are used relatively sparingly and only in a way that makes sense and at a time where it fits. It’s clear that there’s a lot more to come but thankfully Butcher refrained from throwing it in readers’ faces all at once. The plot is solid, isn’t crowded by information dumping and the novel works really well as a paranormal crime type story even without the prospect of further stories. The magic Harry uses is a mix of the traditional staff, pendant and potion type stuff that works really well against a twenty first century Chicago setting. It actually occurred to me while I was typing that sentence that a grown adult magician is actually new to me (at least, as far as I can remember right now) as a protagonist so I don’t know what type of magic I was expecting. What I do know, though, is that I was pleasantly surprised that the series appears to be sticking with the robes and quasi-latin chanting brand in favour of something more modern. It also helped that Harry Dresden is the kind of main character that I like. I’m actually not bitter in person but I do like a cynical narrator. I feel as though I’m saying this a lot these days but I will always respond well to liberal use of sarcasm. It gives the novel a lot of personality and it’s that personality that will have me coming back. There are some other characters that I liked starting to get to know. There’s a faery with a love of pizza, a slightly pervy spirit living on the inside of a skull in Harry’s basement, a feisty and independent detective (Karrin Murphy, my personal favourite aside from Harry) and a journalist that will do almost anything to get the perfect paranormal story. I know that I’m by no means the first to read this series and that most people that are even half interested in urban fantasy will have read this, if not any of the later books in the series (of which, it would seem, there are many). If you are the other person out there that hasn’t read Storm Front yet, though, I recommend it. Overall: I know that I’m not saying anything new by recommending this series. Series don’t get into double figures without a certain level of popularity, I imagine. 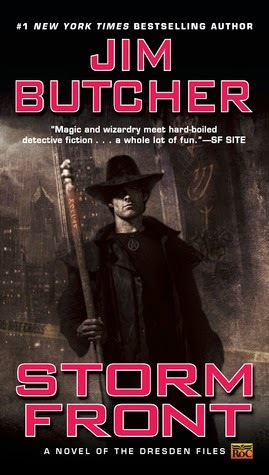 I don’t know how far into The Dresden Files I will be delving but I will certainly be picking up Book 2 and spending a little more time with Harry Dresden the next time I feel the need for an urban fantasy hit.